Sitting here, late on Saturday morning, regretting the peanut butter graham crackers I ate at 2am when I couldn't sleep but really needing a little something to accompany the acidic, delicious coffee I am drinking. It has been a funk inducing week. Family stuff – everyone okay, but still worrisome. Work stuff – superbly annoying to the point of resume searching. But, the weekend is beginning and I will not let the week win. 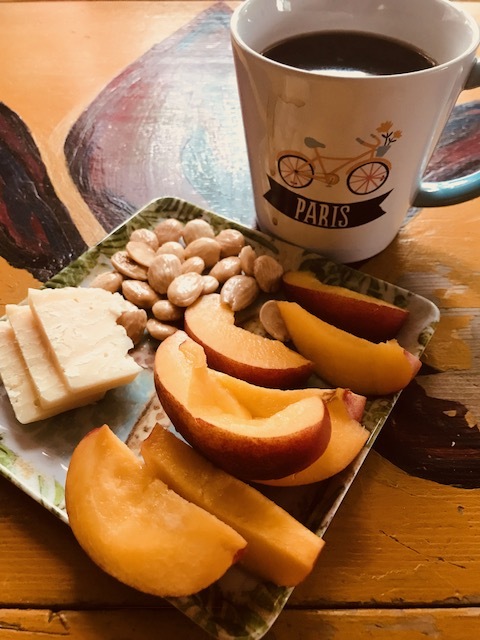 Nectarine, Parmesan, Marcona Almonds. Would never have eaten this for breakfast 40 years ago. Now settle down. I know 'eating your emotions' is not healthy. But, eating good food is a totally different treatment. And good food doesn't mean fancy. Or expensive. There is nothing I love more than to cook a wonderful dinner for family and friends. Yes, it's a lot of work. But it's also therapy, creativity and ultimately an opportunity to create a shared experience. And it's those memories of shared experience, triggered years later by that spicy salsa or that gooey breakfast biscuit which remind us of good times and provide hope for the future. Food can't solve everything. But, sharing food, even the most modest meal, can sometimes be the most powerful medicine. I must admit, I don’t understand suicide. But I do see it’s devasting effects. Keeping the discussion open will hopefully help. I have learned that actual 'good' food doesn't demand eating half the bag! lol! a current fav is dried cherries and a few dark chocolate chips. although now that cherries are in season I would go for fresh!